Barcelona has hundreds of restaurants catering to all tastes and budgets. Generally speaking food here is good value for money and the cost of eating out compares very favourably with other major European cities. If you’re on a budget, I recommend you do as the locals do and make lunch your main meal. The majority of Barcelona’s restaurants serve a 3 course lunchtime set menu for around 10 Euros. Look out for signs saying “Menú del día”. Prices vary, you will find some places that charge as little as €8 others may charge up to €15. In the evening you can then just eat a light meal, maybe a torrada or a couple of tapas which are available in most bars. Bocatas (aka bocadillos) are another good budget food option. These are typical Spanish sandwiches made from half a baguette and various fillings. They normally cost around €3 and are available at pretty much any time of day. Alternatively there’s plenty of international snack food available from falafel and kebabs to tacos and hot dogs. The following are 6 of my favourite budget friendly places to eat. Listed in ascending order of price, they all serve vegetarian options. With so may places serving “bocatas” it may seem strange that I’m recommending a small bar located in an out of the way train station. 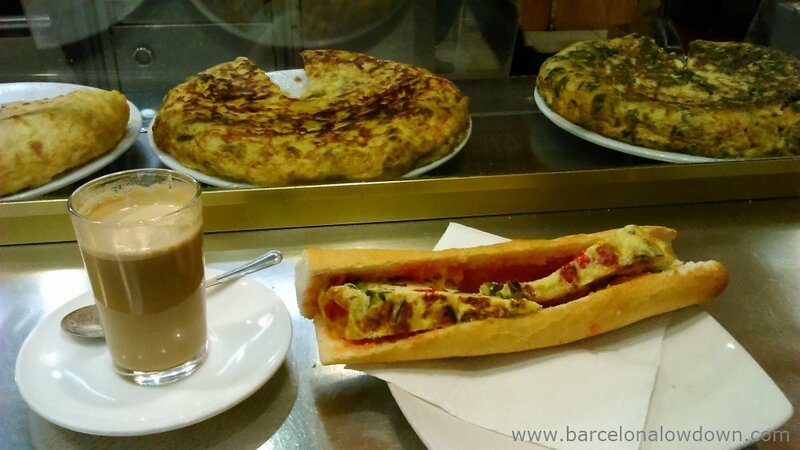 All I can say is that you haven’t tried an omelette sandwich from the bar at El Clot-Aragó station yet! No kidding, the omelettes served here are among the best I’ve eaten anywhere in Spain. They normally have six or seven different types of omlette available as well as plenty of other options. 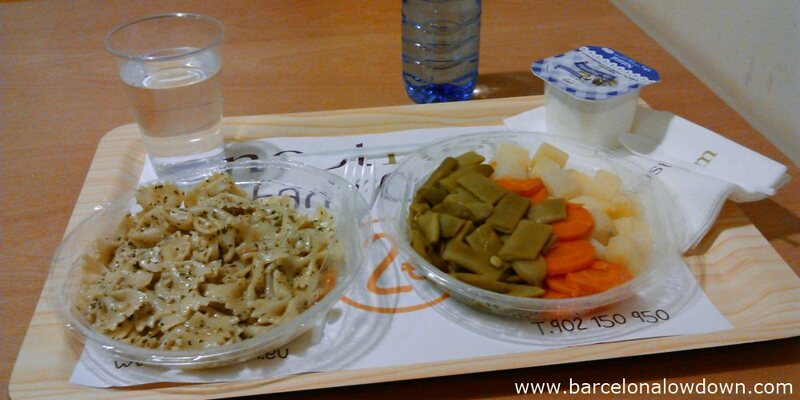 Nostrum is a chain of takeaway restaurants which sell pre-cooked traditional Catalan/Spanish food. Their slogan is “Your mum’s food to takeaway”. It’s pre-packed food but the quality is pretty good and the price is unbeatable. If you join the Nostrum Fan’s Club (annual fee 5€) you get 50% discount which means that main dishes cost from €1 to 3 Euros, deserts 50c to 75c and drinks 75c. If you eat in the restaurant, they charge an additional 30c per person which covers the use of the microwave, plastic cutlery etc. as well as free WIFI connection. *With the “Nostrum Fans Club” loyalty card. The Dog is Hot serves meat and vegetarian hot dogs with a variety of toppings that range from classics like fried onions and cheese to guacamole or chilli con carne. Prices vary according to which toppings you choose, starting at €2.60 for a simple hot dog. Alternatively you can make up your own from a list of ingredients. You also get to choose between white and wholemeal bread. 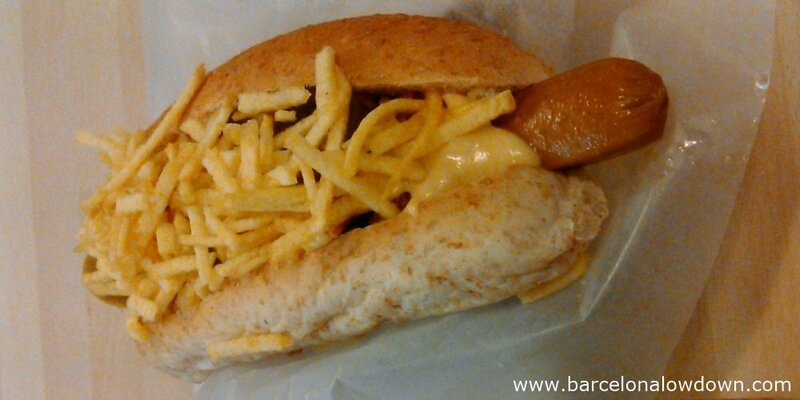 The Sampa Dog which includes melted cheese, mashed potato, sweetcorn, fried onions and crisps is a meal in itself. The only downside is that there’s nowhere to sit apart from a couple of wooden boxes so you normally have to eat standing up. El Buen Bocado has 2 restaurants in the Gothic Quarter where they serve the best tasting falafel I’ve eaten in Barcelona to date. My meat-eating friends tell me that the kebabs are excellent too. The secret lies in the fact that their falafel are made fresh in the reastaurant and served with a generous quantity of salad and freshly cut mint wrapped in pita bread. I promise you won’t be disappointed! Bendito Taco is a small Mexican restaurant tucked away behind the Boqueria food market. 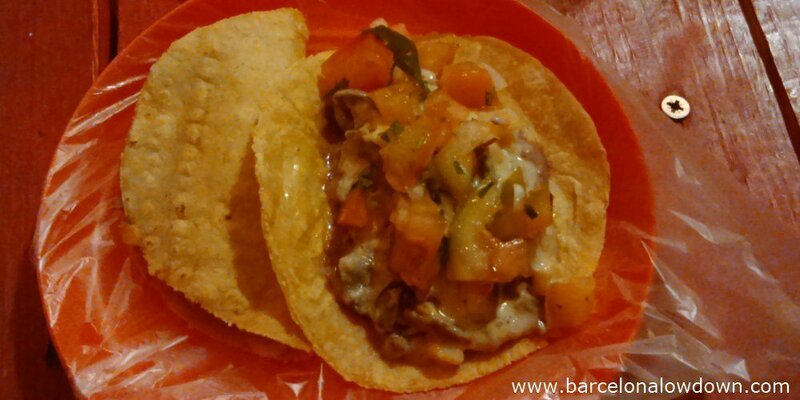 As the name suggests, they sell authentic Mexican tacos as well as burritos, quesadillas and other Mexican dishes. Tacos cost €2 each, they also serve set menus starting at €7. 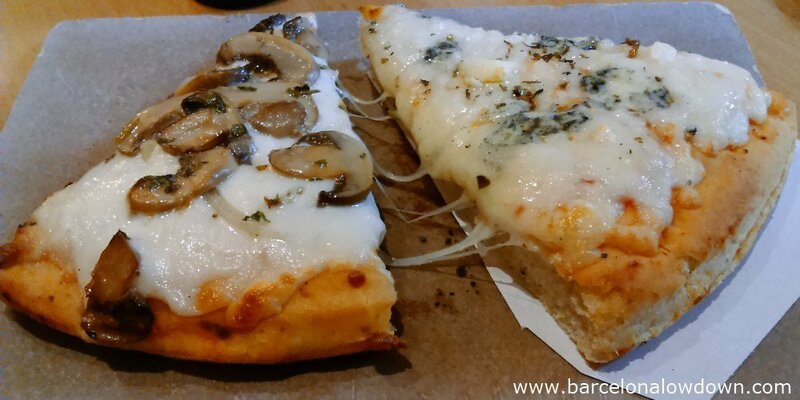 A couple of slices of pizza and a beer at La Pizza del Born is an excellent way to start your evening in Barcelona’s lively El Born neighbourhood. A slice of deep pan pizza costs €1.90 and there are a total of twenty-eight different toppings to choose from including several which are suitable for vegetarians. If you don’t fancy pizza they also serve empanadas (a type of Argentinian pasty) pasta, salads and a range of deserts. This entry was posted in Food & Drink, Tips tagged budget, restaurants, vegetarian and updated on October 27, 2016 by Richard. I like that you say there’s international food as well. I love Falafel! It’s one of my favorite things to eat. I’m heading to Barcelona next year, so I’ve been reading up on the different kinds of food. I’m glad to see that there will be falafel! Thanks for your comment. 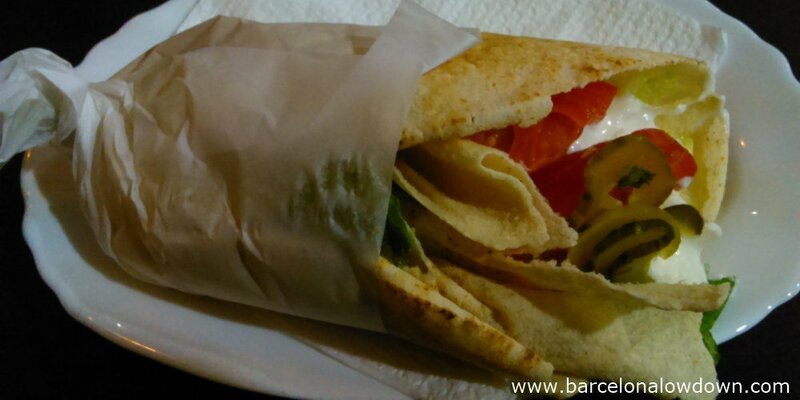 There are plenty of restaurants in Barcelona which serve middle eastern food (especialy in the city centre and in Gràcia) but Buen Bocado is my favourite. Check them out during your visit and let me know what you think. Yummy, the taco and falafel looks awesome. Thanks for making my mouth water and sharing this article. They taste as good as they look, in fact they probably taste better than they look because photographing food is definitely NOT one of my strengths! I’d go as far as saying that the falafels at El Buen Bocado are the best that I’ve tried anywhere!